This router is not only excellent in design, but it is also fitted with ideal features that give it superior technical capability. It is a durable router that is a definite must-have for any woodworker. Very few routers, so to speak, can surpass the power and reliability of this router. The fact that this router has the capability of handling any router bit means the user can never run short of power. The Porter-Cable 7518 router is one of the most powerful and highly efficient power tools for any woodworker. It comes with some of the most useful features and is typical of its style and quality. It is a powerful router with amazing power and innovative features. At a glance, the product is pretty robust and sturdy in design. It has been designed with the technical capability to withstand working site conditions. Its ball bearings are sealed to avoid entry of dust. This helps ensure the inner workings are clean for optimal operation of the router. It also helps lengthen the operation life of the motor. Once you begin using the router, you instantly feel the amount of control you have over the tool. Its huge handles are pretty easy to handle and hence gives you the ability to easily guide the router over the cutting area for accurate and precise cuts. Its variable speed control allows you complete your projects efficiently and with top quality. Auto Release Collet System: We can all attest to the fact that time management is essential when working on any project. Therefore, every second saved while routing is very vital. 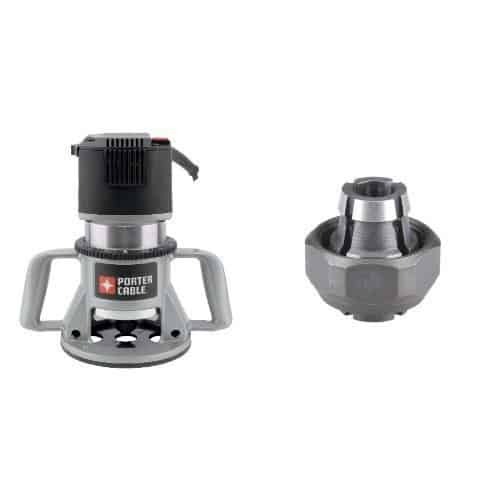 The Porter-Cable 7518 has been designed with an auto release collet system that allows you to change router bits within seconds. This is unlike other routers that have a manual bit change system that consumes time and is clumsy when changing bits. Powerful Motor: It has a 15 Amp motor that has outstanding power and is useful and effective for dense wood cuts. It also ensures a consistent RPM while routing for the best quality cuts and finish. Five different speeds are available with this router, giving the user full control over the cutting process. This is crucial since it offers the highest flexibility with respect to the many types of woods that one will be cutting. The cutting speeds available include 10,000 – 13,000 – 16,000 – 19,000 and 21,000 RPM. A Soft Start: Porter-Cable 7518 comes with a soft start feature that ensures the best quality work is achieved. This reduces the torque and ensures that the woodworker does not rip out any of the wood while starting off the cut. This problem is common with routers that lack the soft start feature. Excellent Design: In terms of router standard, the Porter-Cable 7518 is fairly large but definitely not oversized or clumsy, so to speak. As a matter of fact, it has a smooth operation and is user-friendly when handling any type of cutting. It has the following dimensions: Length 13.50 inches, Height 9.50 inches, Width 11.25 inches, and Weighs 14.5 pounds. Time-Saving: It is fitted with an auto release collet system that saves time when changing router bits. It is also easy to handle. Saves space: Even though this router is large in router standard, it is neither oversized nor clumsy. It takes up some small space in your workshop, unlike other huge routers. Convenient and Highly-Versatile: It has five different speeds which are ideal for a wide variety of routing jobs and material types. It also has an ergonomic design and is easy to handle. It also delivers accurate and precise depth adjustments. Effective: It comes with a powerful motor that delivers superior power for handling all kinds of projects. It is also fitted with a soft start that facilitates the smooth operation for the best quality work. Safety: It has a generous base diameter and quite large grips that give the user complete control making the routing process safe and predictable. It also runs smoothly throughout its speed ranges and without any vibrations. It is powerful and ideal for most operations. It is user-friendly: It has a wide base and it runs smoothly with no vibrations hence its easy to handle. Excellent functionality: It has an accurate and precise depth adjustment hence delivers excellent cuts. Excellent design: It is robust and sturdy in build. It is able to stand and handle all working site projects. Easy to maintain: Its ball bearings are dustproof and thus the internal workings remain clean. Quite large in terms of router standards. Height adjustment: Some users complain about the need to rotate the motor when adjusting the height which usually results in dust lodging in the height adjustment threads. Quite expensive given its amazing features. Always maintain a clean and well-lit work area. Never operate your tool in explosive environments, for instance, in presence of flammable liquids, dust, or gases. Keep children and bystanders away when operating your machine. Always stay alerted and observe what you are doing. Never use the tool when tired or under influence of drugs. Wear protective gear while working on all your projects irrespective of project size or complexity. Never force the power tool and do not use it if the switch is faulty. Also, store the power tool out of reach of children. Maintain the power tools. Check out for any misalignment, any breakages, or any other conditions that can affect the tool. Seek the service of a qualified repair person at all times and identical replacement parts should be used for the safety of the tools. The Porter-Cable 7518 is a router I can recommend for the woodworker who is passionate about routing and is looking out for a router that can handle diverse projects. It is an excellent quality router that facilitates easy and efficient operations. It is worth every penny irrespective of its huge price. It is a long term investment that will pay back tremendous dividends for a long time.